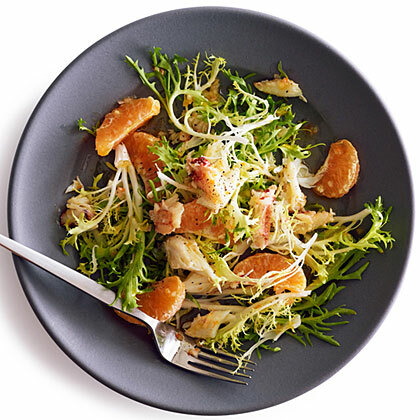 Just a few deftly chosen ingredients make for an elegant, complex-tasting salad. Serve it with warm rolls and glasses of cold, crisp white wine (our wine editor suggests Grenache Blanc). Zest 2 tangerines and juice about 4 (enough to make 1/4 cup). Peel remaining fruit and separate segments; set aside. Mix shallots, tangerine zest and juice, vinegar, oil, and salt together in a small bowl. Let sit at least 15 minutes. Put frisée in a large salad bowl. Top with tangerines and crab. Pour half the dressing over salad and toss to coat evenly. Divide mixture among plates, arranging citrus segments and larger crab pieces on greens. Drizzle with a little more dressing and sprinkle with pepper. Make ahead: Dressing, up to 1 day, chilled.